The parade was everything I figured a World Series parade would be. Players on trucks. Marching bands. Cheering. And not one Shriner on a little moped. This was a parade right up my alley. One of the cool parts of our particular location is that we were only about 200 yards away from the end of the parade and right before our spot, the parade took a right turn towards Union Station from Grand Avenue. Even then, their vision was blocked of the sea of blue humanity by a large skywalk between the Westin Crown Center and Union Station. So it wasn’t until our spot where they first laid eyes upon the hundreds of thousands assembled on the National Monument’s lawn all the way north to the stage in front of Union Station. Just imagine walking out your front door and seeing this mass of blue and white. Individuals, sure, but together it was just a cacophony of people. Breathtaking. General Manager Dayton Moore became particularly emotional when he saw it. It was right in front of us, too. Frankly, it looked like he’d been crying most of the parade. What a lonely job that must’ve been at time to be the General Manager of the Kansas City Royals. Not once did he ever speak off message. He was in charge of transforming a culture brick by brick, yard by yard and it took way longer than he ever thought it would. But there he was, staying on point and he finally came out on top. But there he was mouthing “Thank you” every 10 seconds to as many fans as he could make eye contact. He’s thanking us? He’s thanking the fan base who tried to get him fired a dozen times or more? Could you do it? For a decade? I couldn’t. No way. I’d have murdered someone after the first six months. 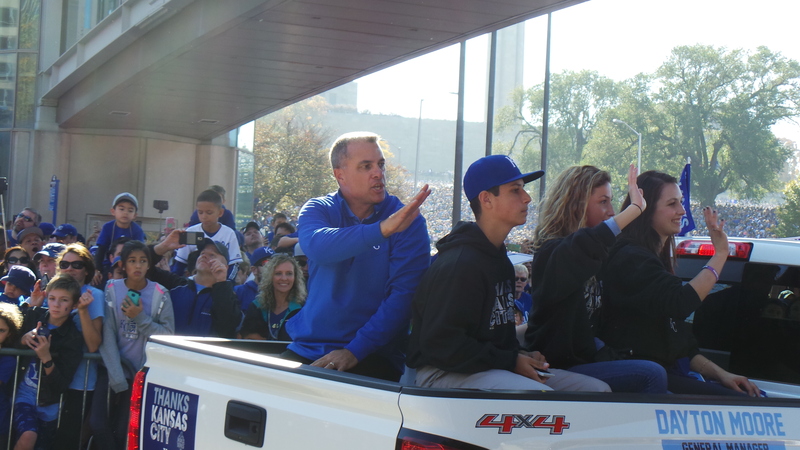 Dayton Moore, Royals General Manager mouthing “thank you” to everyone he could. But there he stood – at the front of the parade – a parade he is largely responsible for. He turns the corner and sees hundreds of thousands of faces and ballcaps and t-shirts. Yeah. He broke down. How could he not? Another cool moment was seeing Paulo Orlando. Maybe on the lower end of the “how much did you contribute” scale, but still had a great postseason. He caught the game ending catch at the end of the ALDS and then got a big RBI in the World Series. But this was a guy who spent 10 years in the minor leagues. He was basically Crash Davis from the movie Bull Durham. Now the Brazilian born outdifelder finds himself in the back of a Chevy truck. As he came around the corner, you could easily see him mouth the words “WOW.” Ain’t life crazy? This was what awaited the players as they emerged from under the skywalk. 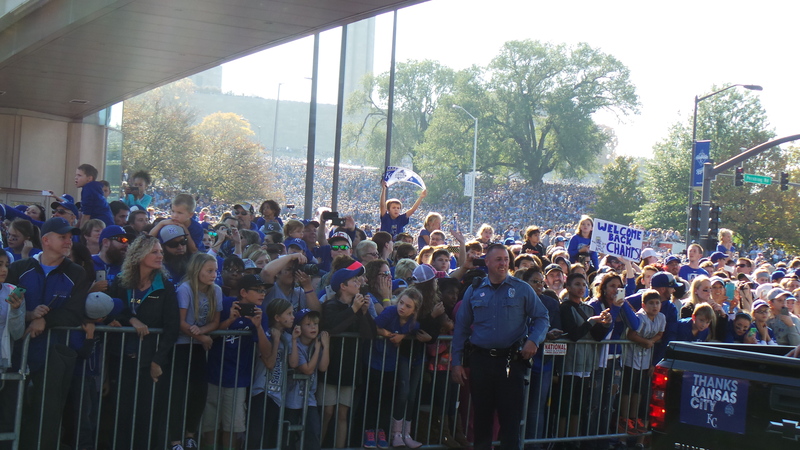 A sea of 500,000 Royals fans stacked up like cord wood. The parade also featured dignitaries like Frank White, George Brett and Mayor Sly James. Listen, I couldn’t tell you one thing that Mayor James is responsible for in our city. I couldn’t tell you if found money to replace a sewer line. I couldn’t tell you if he helped get the new Hyatt Hotel built downtown. I don’t even know his political affiliation. But I will tell you he’s the best god damned cheerleader I’ve ever seen for a city. And sometimes, that’s all you really have to be. His speech at the rally after the parade was all-time and may change the course of the city – or at least give them a rally cry. BEST FANS IN THE WORLD. BEST TEAM IN THE WORLD. BEST CITY IN THE WORLD. This team is like our city, WE. NEVER. QUIT. Yeah, that was a good speech. The parade continued and we had good views of all the participants. There was Alex Gordon, Eric Hosmer, Johnny Cueto all pointing and taking selfies from the trucks. When Cueto went past, there was a distinct JOHN-NY CUE-TO chant which was a far cry from the last time he heard it on the road in Toronto when he turned in one of the worst playoff performances in postseason history. Only to be bookended by two of the best performances in postseason history. The best moment of the parade for my son was when one of his favorite players, Jeremy Guthrie, pointed at our sign and then gave a nod to Brett. Well, Brett’s never the kind of kid who will shout out someo ne. It’s not that he’s shy, he’s just fairly conservative in his words to strangers. But he took the opportunity to shout to Guthrie, “I LOVE YOUR SHOE COLLECTION!” Guthrie is known throughout the world as a collector of vintage and modern Air Jordan Nike shoes. So Guthrie propped his foot up on the bed of the truck to show Brett his Air Jordan Superman 4’s. I’m not sure how those are any different from Brett’s dad’s New Balance 354’s in black. But apparently there is a subtle difference. The best moment for my wife, Kara, was Alex Gordon. Or, rather, Alex Gordon’s arms. There are noises that come out of her when Gordon is on the television that should be reserved for Cinemax after 10:30. The World Series Champions continued to lumber by to heroic cheers. Kendrys Morales, Christian Colon, Alex Rios and even Mike Moustakas led by the MOOOOOOOSE jeep that one of the superfans made up. Each truck received an even louder cheer than the one before. Every five minutes I looked behind me and it seemed the crowd just continued to grow louder and bigger. There wasn’t any square inch that wasn’t occupied by a human being save the three feet on either side of the parade trucks rumbling down Pershing Road. The entire parade was awe inspiring for me. I started thinking about my history with the Kansas City Royals. A life-long Kansas Citian and growing up with my earliest memories of Kauffman Stadium. Playing baseball every waking minute of the day. Toggling between Star Wars action figures recreating scenes from Star Wars and then Star Wars action figures recreating plays from the Royals game the night before. I remember fondly the 1985 team. I remember being at Game 7 and the parade. But I also remember the 30 years that passed in between. I grew from a child to a man and now a father in those 30 years. My life has been reinvented a dozen times over in the process. I could’ve become a sportswriter at the Journalism School at Mizzou out of high school. I could’ve become a minor league umpire back in the early 90’s. I could’ve kept working at Harrah’s casino in the mid 90’s. I ended up working in IT as a rescue assignment away from the boats and here I am, 15 years later still working in IT. But now I’m back writing, sort of. And I wrote a book? And I’ve got a wife of 15 years? And this little snot-nosed baby? Wait. He’s not a baby anymore. He’s shouting out Jeremy Guthrie in a World Series parade 30 years later. All of these thoughts weighed very heavily on my mind. I thought about the symmetry of it all. This postseason has been full of symmetry. You have Eric Hosmer scoring from third in Game 5 of the World Series in what ended up being a key run one year removed from Alex Gordon being stranded on third in Game 7 of the 2014 World Series. You’ve got a dozen examples of things that hadn’t worked out last year, working out this year. You’ve got the symmetry of Ned Yost finally breaking through after being fired in Milwaukee for his team melting down down the stretch. Now he’s the manager of a team that only gets stronger down the stretch. You’ve got Kendrys Morales taking over for Billy Butler. So many subplots and story lines. And then you’ve got me and Fake Ned. I’ll write more about this in Part III, but you’ve got this incredible 18 months since Sungwoo came to America on a lark. You’ve got the good fortune that he brought and the wave of support that was showered down upon him. In many respects, the vein of generosity he was able to tap into last August never closed and continued to spray good fortune and well wishes upon the team and the town. Then at the parade, you finally saw the totality of every once of goodwill all descending on one place. The players and the city saw my city as Sungwoo saw it last August. Everyone getting along. Everyone laughing. Everyone just happy. Last August was perfect and it was exponentially magnified on November 3rd for the entire world to see. It was too much. The parade. The crowd. The awe in the eyes of these players as they saw it in the flesh coming around that corner. And then along came Danny Duffy. Now Danny and I have a bit of a history. Most of it kind of bad. Danny probably couldn’t pick me out of a lineup, but on this blog and then in social media a few years ago, when Danny Duffy was still on social media, we got into a few digital scrapes. Danny was very defensive of criticism and I was very critical of the entire organization at the time. Time seemed to mature us both however, and after I saw his interactions with Sungwoo, I really started to like the guy. He was rehabbing his arm after Tommy John surgery and began a correspondence with Sungwoo about the same time I did. Danny publicly offered to bring Sungwoo to America if he ever had the chance. Of course, Sungwoo declined, but it planted a more tangible seed in Sungwoo’s mind. About a year later, when Sungwoo did decide to come to Kansas City, I had the privilege of a press pass for a few games that year. I gave Duffy a heads up that he was coming and we had a really nice chat. Jump ahead to last August when all the craziness started, Danny and Sungwoo got to meet finally, face to face. The result was a gigantic bear hug, and I think a kiss on the cheek, maybe? It was a weird time. Again, Duffy didn’t really know me from Adam except that I was that obnoxious blogger and I did something with Sungwoo. End of story. We’re done, right? Let’s jump back to the parade and here comes Danny Duffy’s truck. I start waggling the SungWoo sign violently like the biggest fanboi on the planet. I really am the worst. At first you could see Duffy kind of squint to see what I was holding and then his eyes lit up. Ballplayers are just as human as you and I. They hurt when they’re called names. They marvel at the amazement of cramming 800,000 people in one place. They remember certain fans and certain moments that make an impression. Even in the middle of a World Championship parade, for him to send such a personal message back to Sungwoo (and not punch me in the face in the process) was about as class an act as you could get. The parade ended with World Series MVP Salvador Perez and my favorite part of the parade, Ned Yost hoisting the World Series trophy. I’ll write more about that tomorrow. But the embrace will be my favorite memory of probably the entire year. For these two random people to connect in that way. 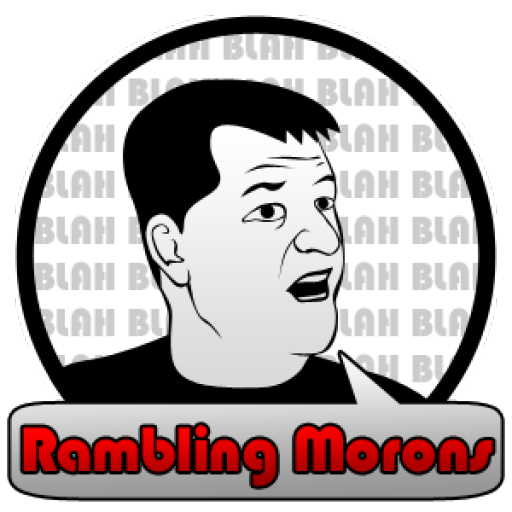 For two bullheaded internet morons, one who happens to play professional baseball and one who happens to make fun of professional baseball players sitting in Mom’s basement – for those two random people to connect in this time and place. A time and place separated by 30 years from when a young boy waited for a parade that would never come. For that boy to take a long and winding, bumpy road. And for it to crescendo like that? A bear hug from a World Champion? Yeah, I’ll take that. That seems like a great way to close it out. There’s nothing wrong with some bro hugs and a few tears on a crystal blue day in November. It was exactly the way to embrace the moment. New Balance Shoes hahaha! In your story you talked about symmetry. I love the symmetry in your writing! Great article! Really great stuff, man. LET’S GO ROYALS!